- Rep. John Larson, Sit-in ringleader whose Connecticut district is near Sandy Hook. “Where is our soul? Where is our moral leadership? Where is our courage?” Lewis shouted Wednesday when he began the sit-in, his preacher’s voice loudly echoing in the House chamber. Brow furrowed, he angrily pounded the podium. He paused for a moment, the chamber silent. For some of them, getting down on the floor wasn't easy. Some were older and arthritic, some were women in short skirts and high heels, and one of them, Tammy Duckworth, a former Blackhawk helicopter pilot whose legs had been shot off over Baghdad, had to work her way out of her wheelchair and remove her prostheses in order to sit on the floor with her compadres. Speaker Paul Ryan quickly shut the place down, calling for a short recess until the Democrats came to their senses, and, as is the rule when the sessions are in recess, the microphones went dead; the chamber cameras went dark. Then, as if the revolt by the Democrats in the form of an actual sit-in wasn't extraordinary enough, something even more amazing happened. Several House members, using their smart phones, began live-streaming the event via Twitter's Periscope. Before long C-Span, against House rules and entirely on their own, picked it up and began broadcasting the live-stream. It had its glitches. As phone batteries went dead, C-Span hosts ad-libbed, filling in the minutes until borrowed battery packs could be installed or someone else picked it up and fed it to them live. People kept bumping into or standing in front of the cell phones, but they were quickly righted and put back into action. 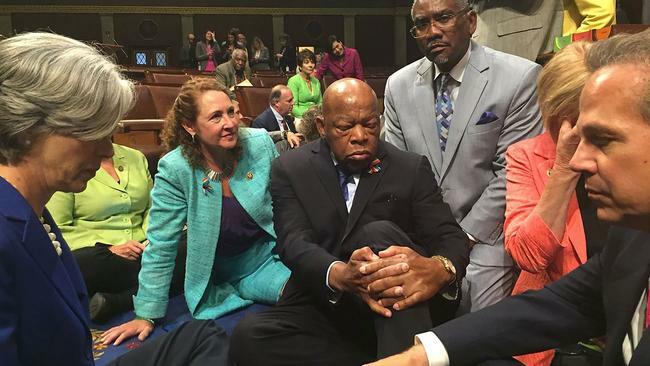 Within seconds after John Lewis announced the sit-in, Twitter and Facebook exploded. News spread that something big was happening on the House floor (literally), and for one brief shining moment even Donald Trump couldn't draw media attention away from the disobedient but mostly civil Democrats who had finally had enough. It was a sit-in that felt like a loose version of a filibuster. A long line of representatives took turns standing before the dead microphones, passionately begging for the chance to vote on sensible, common sense gun control, hoping the cell phones would pick up their voices and send their message afar. Within a few hours, several senators came in to offer their support. Elizabeth Warren sat on the floor for a time, left, and then came back again, this time with donuts. Al Franken, Bernie Sanders, Gary Peters, and a number of other senators made appearances. It went on for more than 26 hours, with a few bathroom breaks and cloakroom naps. Elizabeth Warren bought donuts. Cases of bottled water arrived. Someone else ordered pizzas. For more than a full day those of us who have been waiting a long time for something like this sat riveted. It was awesome. Did it change even one single mind on the Republican side? No. Will the NRA stand down and stay out of government business? Of course not. But we saw democracy in action. We saw the Democrats acting like Democrats. It did my heart glad.